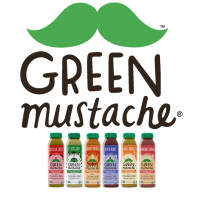 Green Mustache is a Brooklyn-based producer of cold-pressured green smoothies (www.getgreenmustache.com) and soon, snacks! Each bottle of our certified organic, Non-GMO Project Verified smoothies contains two cups of kale and spinach, fruit and superfoods like chia and coconut water. We blend–rather than juice–our drinks to retain the fiber and nutrients found in the skin and leaves of our organic produce. Fiber helps to stabilize the natural sugars of our fruit and veggies, providing sustained energy, and helping to promote better digestion. As a socially responsible company, we donate 1% of sales to Vitamin Angels, a non-profit organization that helps at-risk populations gain access to lifesaving and life changing vitamins and minerals.